Firefox Profiles has to be one of the most underrated features a browser has ever offered. Back in the day when multiple users shared a single Windows account, Firefox Profiles allowed you to have different setups for each person in the family. That way, Dad's recipe bookmarks didn't get in the way of Mom's sport scores. 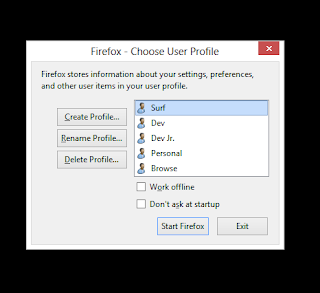 Between the feature being relatively hard to setup and the fact that Windows now offers multiple accounts by default, Firefox Profiles are all but ignored. Surf. This should probably just be called 'Work', but whatever. This is where I have all my tabs relating to, well, work stuff. I'm logged into Google Apps here, and any other web app that relates to my day job. This profile has a few key plugins, and I almost never clear the cookies or cache on it. Dev. This is where the magic happens. I use this profile to develop and debug web related stuff. This profile has a number of key plugins (Firebug, Fiddler, DNS flusher, etc.) that could potentially slow down normal web surfing. I clear the cookies and cache on this profile all the time. Nothing in this tab is considered sacred. Dev Jr.. This is another dev instance. Having two allows me to log in as two different users to the same website (each profile has its own cookies, and therefor session data). Or, I can use 'Dev' to log in as the admin to a site and 'Dev Jr.' as a regular user. Personal. Personal stuff lives here. By using a separate profile, my Personal Gmail never gets mixed up with my business Google Apps (both are accessed via mail.google.com). Just like 'Surf' there aren't many plugins needed to power this profile. Browse. 'Browse' is as close to a default instance of Firefox as I can get. No plugins, no bookmarks, no anything. I use it when Firefox seems broken, as I can quickly tell if it's some issue with plain old Firefox or my particular configuration. As a person who uses his computer for both Business and Personal stuff, I can't imagine life without multiple profiles. As mentioned, setting up profiles is relatively cumbersome. Apparently, there are Firefox Plugins to make managing profiles easier. OK, now you've got all these different profiles running. How the heck do you tell them apart? My preferred way is to give each one a theme. I tend use dramatically different color schemes, so it's relatively easy to tell which browser does which job. As a result, holding down Control+Windows-Key+s brings up the Firefox Profile Manager, and let's me pick which instance of Firefox I want to start. I've recently discovered that Chrome has a similar feature, though I don't know how well it works in practice. Lately I've wondered whether I ought to use separate OS accounts to keep work and personal stuff separate.